← Are You Daring Enough to Use Eco-Friendly Feminine Hygiene Items? My parents and their siblings were of the generation that grew up during the depression in the 1930’s. Things mattered to them, even something as small as Christmas wrapping was considered precious. My Aunt, God rest her soul, saved Christmas paper and those silly little paper bows from year to year. She would very carefully (and slowly) unwrap her gifts so as to be able to preserve the paper. She also scarfed up any other gift wrap that looked usable, and she stored it carefully away for use the next year. While I am not that thrifty, and I love prettily wrapped gifts, I don’t like to spend a bunch on wrappings. Here are some thoughts on ways to save money when you wrap this years gifts. Use paper drop cloth to wrap. At Lowes online you can get 144 feet of brown, heavy paper for around $9.00. that is more or less equivalent to 5 big rolls of printed Christmas wrapping paper, which costs around $3 per roll – a savings of around $6 overall. I bought a roll in 2011 and have been using it for everything from Christmas wrap to kid crafts to posters to mailing packages every since. Dress it up with artwork or natural greenery as shown in this post from Parents. Use paper from other sources. If you get newspapers, use newsprint with bright colored ribbon or bows. If you have old maps you no longer need, use them. For small packages, find interesting magazine pages to use in wrapping. Do you have old calendars with beautiful pictures? Use those as well. Save any shopping bags you get through the year – especially the paper ones or ones that are unique in design, then use them at Christmas time. If you are like me, you have old material or clothing that is no longer loved or needed. How fabulous would that gift look wrapped in part of your old velvet cape? 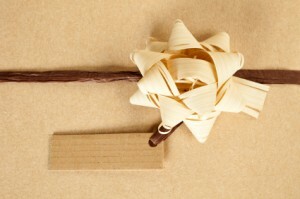 Dig out that box of material you thought you might use and pick out some pieces to use for wrapping, or to make bows. My brother once cleaned potato chip bags after turning them inside out and used those as gift bags! Do you have some leftover wall paper you won’t be using? Try that! If the gift is small, wrap it using aluminum foil for a shiny treat. And, yes, save your paper. When I encounter a particularly large, heavy piece of wrapping I do save it from year to year, if it is pretty enough. Make your own gift boxes using Origami. This is easy to do and doesn’t take much in the way of time or materials. My 5 year old grand daughter did it last year in my Grandma Rie’s Money Camp. This You Tube video shows you how. Some retail stores do still give out gift boxes for free, always check if you are buying in a brick and mortar store. Use last years cards to make your gift tags. Christmas cards are becoming a forgotten tradition, but we still get and give some. If you saved last years cards, you can usually cut them so that the picture shows, punch a hole and put the name of the recipient on the blank back. Use coordinated wrapping paper to make your gift tags. Simply cut a rectangle of whatever you used to wrap the gift, fold it in half and use a hole punch to make a hole. Slip some string through the hole and tie it to your package – or just tape it. Decorate the paper if it is plain. Use free down loadable templates to print your own gift tags. The Jones Design Company will, for the price of your email id, let you down load several different tag design pdfs to print and use. Shop garage sales and thrift stores and estate sales. Christmas decorations, wrap, bows and ribbon all are continuous offerings at pretty much every garage sale, thrift store or estate sale I’ve ever shopped. Three years ago, I bought a bag of new holiday ribbons that would have cost me upwards of $50 if I had purchased them from a retail store. I got velvet, gold, paper, wide, narrow and sparkly ribbon for pennies on the dollar. I’ve also found beautiful silk floral Christmas poinsettias, greenery and other arrangements for a buck or two for multiple stems. These are also great places to get gift bags of all sorts. Holiday tins are also bountiful at these sales. Use them to package your home made Christmas cookies and candies. Shop the after Christmas sales. I do use regular wrapping paper and tags, if I can get them on sale. Since we throw most of our Christmas stuff up in the attic after the season, we have plenty of storage room for it. I shop the after Christmas sales mainly to snarf up new wrapping paper and tags – when they are 50 or 75% off. What have you done to save money on wrapping, yet still present beautiful gifts? I usually buy gift wrappers that has a promo like buy one take one. In this way it can help me to save a one wrapper. One free is better than none free! Some things are good for the soul, if ripping paper helps yours then go for it. I wonder if anyone has calculated the carbon footprint of Christmas…? It’s gotta be huge. This year I plan to buy some discounted Christmas fabric and make reusable bags to use next year and the years ahead. Melissa, that is a super idea! I knew a lady who used old cookie tins for boxes; sometimes she found special ones from Christmas and used those without added wrapping. Now that I remember it, she also used to bake a lot and give out cookies and sweets as presents. I remember the newspaper idea. Cartoons were good for kids gifts. Oh, and you’re not the only one with the aunt who saved bows, ribbons, paper, boxes and had a special location for storage. Which brings up an idea for a blog topic, ornaments. Another wacky money-saving idea is if the gift recipient has an equally dry sense of humour then you can simply wrap the item in normal, plain paper (perhaps recyclable) and write ‘WRAPPING PAPER’ on it with a marker. Maybe accustomed by a drawing of something like a smiley face and a little personal message (To You From Me) it will actually be more valuable to them than some funky coloured wrapping paper from the shop. I’m far from a craft expert and I can barely fold things neatly, but even I can do this. In the end the only thing that matters is the gift itself and the love you’re sharing with them.